Annual inflation cooled down to 12-year low of 4.5 percent in fiscal year 2016-17, as prices of food and non-food items went up moderately. The annual inflation of the last fiscal year, which ended on July 15, is the lowest since fiscal year 2004-05, says the latest Macroeconomic Report of the Nepal Rastra Bank (NRB), the central bank. The actual annual inflation of 2016-17 is way lower than the NRB’s estimate of 7.5 percent. This is the third time inflation target was beaten ever since the NRB started launching annual monetary policy in fiscal year 2002-03. 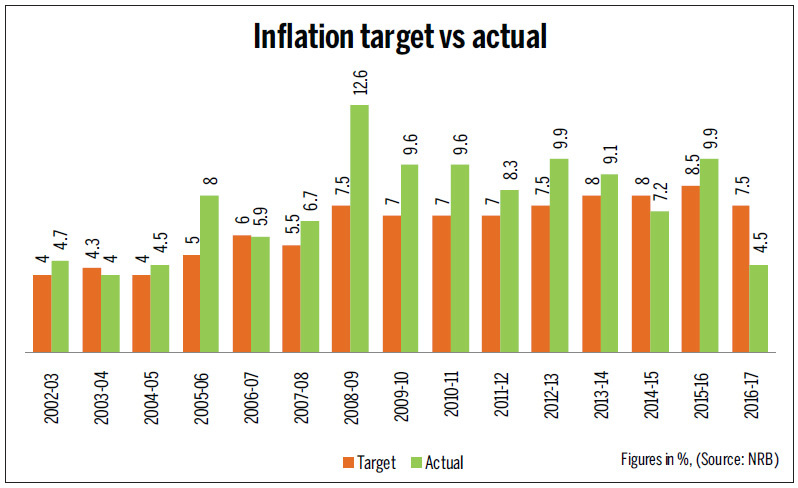 The NRB had beaten its own inflation target only in 2003-04 and 2006-07. Consumer prices rose at much slower pace than estimated in 2016-17 because of higher base price of 2015-16, improved supply situation and lower global commodity prices, including those in India, says the NRB report. In 2016-17, food prices rose by an average of 1.9 percent, as against 10.9 percent in 2015-16, following decline in prices of ghee and oil by 6 percent, pulses and legumes by 5.5 percent and vegetables by 2.5 percent, says the NRB report. In the same year, non-food prices increased by an average of 6.5 percent, as against 9.2 percent in 2015-16. Inflation has been moderating in Nepal since November and stood at less than 4 percent beginning December. It further cooled down to 2.7 percent in July, the lowest since October 2004. Consumer prices rose at the slowest pace in almost 13 years in July, as food and beverage prices fell and prices of non-food items went up moderately. Food and beverage prices fell by an average of 0.9 percent in July, while prices of non-food items went up by an average of 5.6 percent in that month. Food and beverage prices fell in July following reduction in prices of pulses, legumes, vegetables and spices, shows the NRB report. Prices of pulses and legumes plunged by 21.2 percent in July, while prices of vegetables dropped by 13.7 percent in the same month. Also, prices of spices fell by 1.4 percent in July. In non-food category, communication prices dropped by 1.2 percent in July. It is not known whether inflation will continue to moderate in the coming days, as torrential rain that triggered floods in the second week of August has wiped out Rs8.11 billion worth of crops in 31 districts of the country. The floods damaged paddy worth Rs3.18 billion, vegetables worth Rs2.96 billion, pulses worth Rs536 million, fishes worth Rs800 million, turmeric worth Rs340 million and maize worth Rs241 million, according to the Ministry of Agricultural Development. The ministry is yet to calculate the loss of food stored by people in their homes. These losses are likely to raise the country’s food imports in the coming days, triggering inflationary pressure. Food and beverage make a contribution of around 44 percent to the consumer basket, based on which inflation is determined.